Posted on 11/25/2018, 5:41 pm, by kittykill, under Handmade Gift Ideas, Holidays. Teachers are the most amazing people in the world. Treat them to something different the holiday season with Sweets4ever’s tutorial for a Teacher Toolbox. 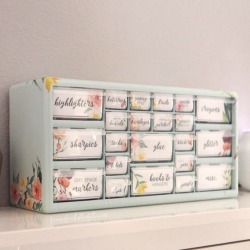 Using a a little glue and clip art she transforms a drab utility box into a beautiful one a kind storage space that is full of everything a teacher may need (GLITTER!). This toolbox is also great for the crafty people in your life. They will love the organizational help and the extra craft supplies (MORE GLITTER!). If you want to get into the Christmas spirit, you can turn this toolbox into an advent calendar and reuse it for many years to come. From teachers, to mail carriers to neighbors; our Handmade Holiday Gift Guide has gift ideas for every person in your life.